Note to my Readers: Hard to believe that I have not posted in over two months. For awhile I was writing at a feverish pace and the stories were abundant and rich. Like all of us who are fortunate to spend time with our family and friends at the holidays, I became part of the hubbub and was swept away with the December joy of it all. I kissed my grandchildren, made cookies, played in the snow, sat in front of a crackling fire and sipped lovely wines from South Africa. And I stowed my notes and my laptop and made memories with my family. The month of January has brought unprecedented amounts of snow to Philadelphia along with a blizzard of emails from family researchers across the world. Tucked away from the howling storms and curled up with my Dell laptop I once again have picked up the thread of histories other than my own and began the business of time travel in February…no pat downs…no lost luggage and no jet lag. And very little geographic distance. In June of this year in the Cradle of Liberty I will celebrate my family and share a remarkable history that spans the globe with my Tegner cousins. “Stu” as he signed his name in a family photo was the son of successful Philadelphia merchant, shipping agent and prominent citizen, Levi Eldridge and his second wife, Martha Mitchell Stuart. Born in 1843, Stuart grew up in the Fifth Ward of old Philadelphia just a short walk from the Old Pine Street Episcopalian Church that the Eldridge and Stuart families attended. At the time of Stuart’s birth, Philadelphia was second only to New York City as a major shipping port and was first as a publishing mecca in the young nation where Edgar Allan Poe published his prize story “The Gold Bug” in the Philadelphia Dollar. Great social and political events were part of the rich life that would welcome baby Stuart into the world. In 1843 Frederick Douglas railed against the injustice of slavery at an abolitionist convention in Philadelphia. Sharing the podium with Mr. Douglas, Susan B. Anthony delivered an eloquent speech supporting the abolitionist movement and passionately promoting the Women’s Suffrage Movement. While Levi and Martha enjoyed the comfort of their faith and the security of their financial success, they suffered the loss of two children including an unnamed infant daughter born in 1848. In 1845 Levi lost his daughter, Mary Elizabeth, to a childhood disease and buried her next to her mother, Mary Crowley in the Old Pine Street Episcopalian Church Cemetery. Stuart remained their only child until the Eldridges who were longing for another child, adopted Lillie Cecelia shortly after her 1848 birth. One more child was born and lost to the Eldridges. In 1851 one year old “little Katie”, as she was named in her epitaph, succumbed to scarlet fever. She, too, is buried in the churchyard with her siblings and her father, Levi and her grandfather, James Stuart. Business was thriving for the Union Steamship Company and Levi as the industrious General Agent for Philadelphia and his brother-in-law, Sea Captain Daniel McBride, were well known figures at the wharves of what is now Penn’s Landing. When Levi died at the age of 49, his minister, Reverend Thomas Brainerd delivered a moving sermon at the Old Pine Street Presbyterian that was eventually published as a commemorative of the occasion. Levi was a man of great character and tender heart and was one of the notable Elders of the church. This final tribute to a gentleman of Old Philadelphia still rings with great emotion. Left to raise eleven year old Stuart and six year old Lillie, Martha reached out to her large Philadelphia family for help. Stuart was becoming a young man and needed a strong male hand to give him guidance and support and so Martha sent her son to Waukesha, Wisconsin to live with her cousin, Stewart Mitchell. Stewart, a graduate of Princeton and a Presbyterian minister affiliated with Carroll College was just the right influence for Stuart. It was in Waukesha, Wisconsin that Stuart met Frances Lorinda Heath and where my family and the Tegners converge. Born on March 26, 1847 in the lakeside village of Pewaukee, Wisconsin to Judge Chauncey Graham Heath and his wife, Frances “Frank” Minerva Williams, little Fanny Heath would grow up in the throes of a territory becoming a state and her father’s vigorous political life. Chauncey and his brothers John, James and Ebin Heath were pioneer settlers of the Waukesha area from Caroline, New York. Older brother, James, like Chauncey, was politically active and a Justice of the Peace. James Nelson Heath worked as a carpenter eventually becoming a successful lumber merchant in Pewaukee. John Murat Heath ran the Heath House hotel, a major center of social activity and a genteel welcoming beacon for travelers in the Waukesha area. Youngest of the Heath brothers, Ebin Cook Heath established himself as a jeweler in Waukesha finally relocating his business in Milwaukee. Though the Heaths had left their central New York home and family behind, the brothers brought a strong sense of family and community service with them to their new homes in Wisconsin. The Organ Society held fundraisers in the Heath home for the Episcopalian church and, of course, friends and family were a constant presence at the popular couple’s home. The one sadness that marred the happy family life was the loss of the Heath’s one year old son, Austin Webber Heath, in 1851. Frank graciously opened her home to Waukesha area couples who wished to be joined in matrimony by her husband who was also the Waukesha Justice of the Peace. 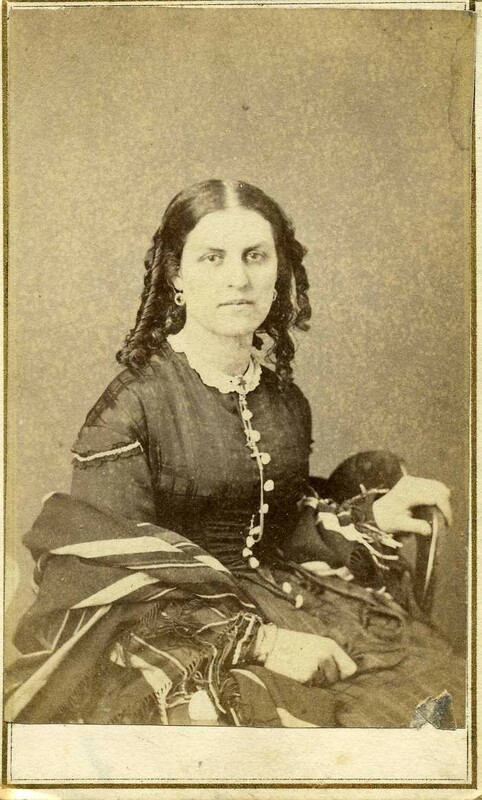 On November 3, 1859, Frank’s younger sister, Frances “Frank” Amelia Williams was married to Dr. Fisk Holbrook Day in the lovely parlor of her sister’s home by Dr. Day’s father, Reverend Warren Day. Like Chauncey and his wife, Fisk and Frank Day had both left their central New York homes behind to become Wisconsin settlers. In an historical biography of Dr. Day, it is revealed that he was an avid amateur geologist who had a fascination for Silurian fossils. His collection remains inventoried at Harvard University. It is easy to imagine Fisk scouring Pewaukee and Waukesha areas which are rich in Silurian deposits. So it was that Frances Lorinda Heath grew up as the cherished daughter and only surviving child of Chauncey and Frank Heath. She no doubt found her childhood in the picturesque village of Waukesha filled with her father’s energy and passion for the politics of the young state of Wisconsin and eventually the calling of his nation’s business in the Treasury Department in Washington, DC. Chauncey’s boundless ambitions were complimented by his wife’s gracious nature and her devotion to education, music and her church which no doubt prepared young Frank for life with James Stuart Eldridge. In the tumultuous days early days of the Civil War Chauncey and his Republican brothers quickly rallied to the Union cause embracing the Union Party label and the young men of Waukesha answered the Union call in the summer of 1862. Among those young men was seventeen-year-old Stuart Eldridge who was mustered into the Union Army’s 28th Regiment Wisconsin Volunteers, Company B in Camp Washburn, Wisconsin on October 13, 1862. Training immediately commenced at Camp Washburn located just outside of Milwaukee. The 28th dubbed itself the Waukesha Minutemen in a spirit of patriotic fervor. Stuart and the Twenty-eighth left Wisconsin on December 21, 1862 for Columbus, Kentucky to engage in guard duty and to take part in the fortification of Columbus. During January 1863, the Twenty-eighth left Kentucky to become part of an expedition on the White River in Arkansas. Stuart and his comrades spent the year of 1863 in a number of confrontations with Johnny Reb in Arkansas and along the Mississippi. Skirmishes were won and lost, but the regiment held their own. Sergeant Stuart Eldridge was discharged from the 28th and promoted to 1st Lt. 64th U.S.C.I. (United States Colored Infantry) on 1 Jan 1864. 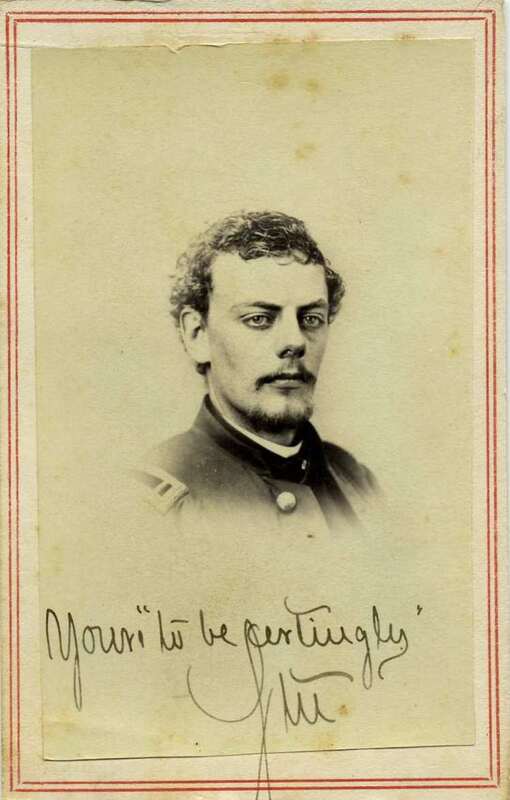 Stuart had clearly distinguished himself as a leader during the Civil War and the newly wedded young man found himself attached to the staff of General O. O. Howard in Washington, D.C. by 1866 where he served as acting Assistant Adjutant General enforcing the Freedman Bureau’s Proclamation. Shortly after the assignment to General Howard, Stuart served under General Ulysses Grant in the nation’s capital which led to a lifetime friendship of the two men. On November 8, 1865 the dashing Lieutenant Stuart Eldridge wed his Wisconsin sweetheart, Frances Lorinda Heath, at St. Matthias Episcopal Church in Waukesha. The impressive stone edifice had been built in 1853 and still stands as an active church in Waukesha. Records of the marriage archived at the church were also entered into the Heath family bible and announced in the Waukesha Freeman with a flowery tribute to the bride and her love. 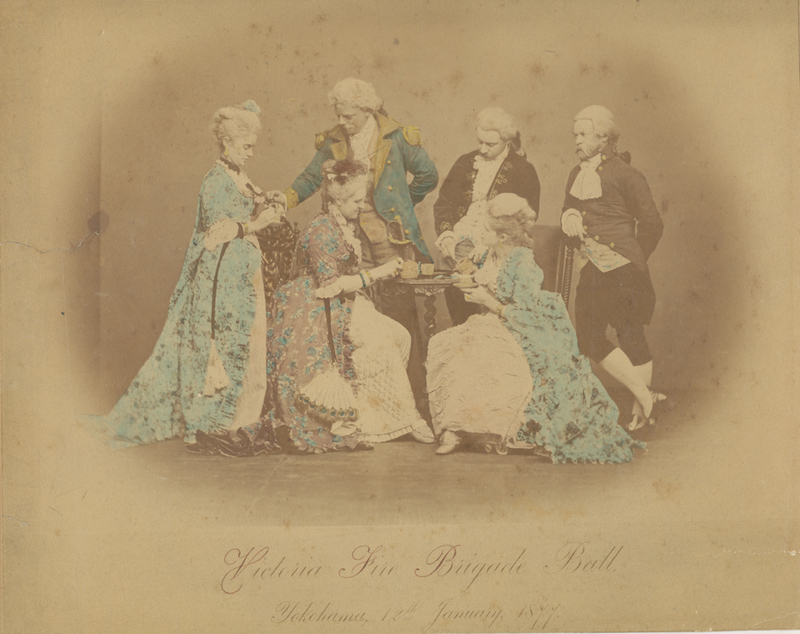 An assortment of choice cake was served after the nuptials and the young couple immediately boarded the noon train for Vicksburg where Lieutenant Eldridge was stationed. Stuart and his bride had begun the great adventure of their lives that would first take them to post Civil War Washington, D.C. where he was the first librarian for the Agricultural Department. During their residence in Washington, D.C., Stuart took up the study of medicine and obtained his M.D. from the old Georgetown faculty. He was appointed to the position of Assistant Demonstrator of Anatomy in college while he was the full time Librarian. It was his position with the Agricultural Department which eventually lead to his assignment in Yokohama, Japan in 1871 as part of the General Horace Capron Expedition. Three years after Stuart and Frank’s Waukesha wedding, his adopted sister, Lillie Cecilia, married Waukesha native, William Henry Gaspar, in Philadelphia. William immediately brought his bride and mother-in-law, Martha, to his Waukesha home. Shortly after returning to Waukesha, William moved his family and his furniture business to Oconomowoc, Wisconsin. Lillie and William would move one more time to La Crosse, Wisconsin and there raised their seven children. Researcher “cousin”, Sue Campbell is a direct descendant of Lillie and William Gaspar. It was shortly after Stuart’s arrival on August, 23, 1871 that his connection with the agricultural branch of the commission was severed and he was appointed by the Japanese Surgeon General of Hokkaido and stationed at Hakodate. Stuart wrote prolifically to his wife upon his arrival and his journals now are held in the tender care of his Tegner heirs. The transcripts have been posted in a blog written by his great grandson, Henry Tegner. In 1875 the appointment contract was ended and Stuart removed to Yokohama to enter upon his medical practice there. Stuart and Frank Eldridge were a popular and respected couple in the Yokohama community-“a handsome picture” as told in Stuart’s Waukesha Freeman obituary. Their love of Asian culture and Stuart’s dedication to the health and well being of others was apparent in the recounts of their life and his career of over twenty years in Yokohama. Children were a welcome blessing to the Eldridges. Their young son, Chauncey, who was born in Wisconsin just one year after his parents’ marriage, found life in Japan exciting. His father writes in his journals about Chauncey’s thrill at learning to ride his pet donkey. Frank and Stuart were once more blessed by two lovely daughters, first in 1873 Beatrix Stuart Eldridge whose pet name was Trixie and then Frances “Fanny” Heath Eldridge in 1876. 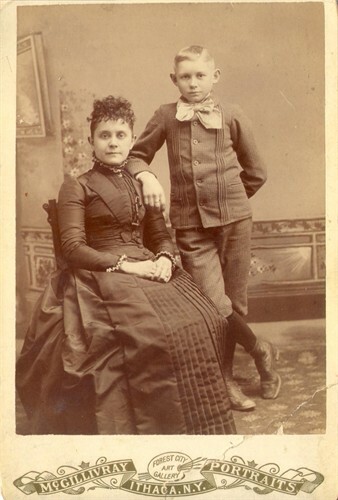 In 1882 their eldest child and only son, Chauncey Webber Eldridge, died unexpectedly in Princeton, New Jersey at the age of 16 of rheumatic fever while he was attending school. Brokenhearted grandfather, Chauncey Heath, travelled to New Jersey to accompany his grandson’s body back to Pewaukee where he was interred next to his grandmother, Frances Minerva Williams Heath in the Prairie Home Cemetery and where grandfather Chauncey would eventually be laid to rest. After Stuart’s unexpected death in 1901 at the age of 58, Frank remained in her home in Yokohama. Frank applied for an emergency passport aft er the disastrous earthquake in 1923 that measured 7.9 on the Richter scale and devastated Yokohama and made her way to her widowed daughter, Beatrix in England. 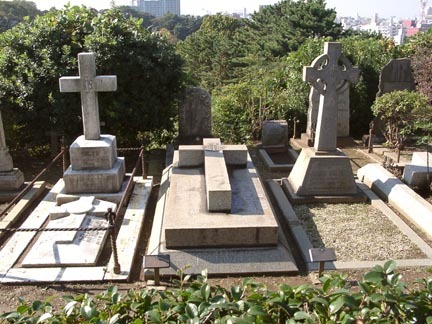 She and Stuart are buried in Yokohama Foreign General Cemetery. I have spent months reading about Dr. James Stuart Eldridge searching for references to just who his wife… my great grandmother’s first cousin… was…and with the heartfelt wish that I would find an image of Frances…though now I feel so close to her, “Frank” has become familiar and comfortable. I think somehow Frank took my hand and brought me from her mother’s Enfield, New York home and the households of her father’s Heath family members in nearby Lansing and Seneca Falls to the little lakeside Village of Pewaukee, Wisconsin just over 800 miles away. While I lingered in Waukesha with the Heaths…with a side trip to Milwaukee to the home of Fisk and Frank Day….Frances Minerva passed my hand into her daughter’s and she took me on a journey to the Meiji period of Japan and to my cousins in modern day Great Britain. My great grandmother was Elizabeth A. Williams Purdy, daughter of Oliver S. Williams and Mary Van Dorn of Enfield, New York and I am now the steward of her family bible. She was a central character in my mother’s storytelling of her Ithaca childhood. Grandma Smith. Initially married to my great grandfather, Elbert Purdy, she was a grandiose woman with a high sense of propriety that she dramatically imposed upon her children and grandchildren. After Elbert’s death, she remarried to a gentleman named Charles R. Smith and referred to herself in the first person as Mrs. E.A. Smith. I am her great granddaughter and though I never met her, her imperious presence is as solid as mahogany in the collection of memories that my mother and her sisters shared with me. My mother loved her and she loved my mother enough to pass down the family bible to her. My mother loved me and gave me the same honor. My great grandmother has held court in my family’s heart and mind all of my life and when I began the genealogy “thing”, it was her story that caused me to open the family bible and begin the research of her young life as the daughter of Oliver and Mary Williams in Enfield, New York. The census details gave me a small glimpse into their Enfield life…their neighbors and family members…the physician and the merchants…the farmers and the tavern keepers, but it was Oliver’s mother’s application for dower rights in 1863 that told me who his siblings were. And then I knew my 3G Grandparents were Dr. Parvis Austin Williams and his wife, Lorinda “Lura” King. The tapestry of extended family history began to take shape across a network of discoveries through the DAR and with the help of my researcher partners Karen Dickson, a Ulysses New York historian and “cousin” and Caroline historian, Barbara Cone, in Tompkins County, New York and her wonderful information on the Heath family. After Karen had provided me with Frances Heath’s death notice in an Ithaca newspaper, I was off to Wisconsin and her life there. I met Chauncey Heath’s family and his father, Milo’s descendant, Susan Bingler. In cooperation with Caroline historian, Barbara Cone, we created a picture of life in Caroline, New York, Pewaukee and Waukesha, Wisconsin and Heath family history. So I Googled® and I called and I emailed. First, it was Dr. Fisk Holbrook Day of Wisconsin and his wife, Frances Amelia Williams. Their descendant daughters, Margaret Amelia, Minnie Frances, Sarah Caroline and Florence were active DAR members and, thank goodness, registered their mother’s maiden name and place of birth along with their father’s central New York history. I tripped over “Minvera Heath” for awhile…got lost in a wrong turn in Minnesota…that is “out of state” as referenced in her mother’s dower application…when Karen Dickson put me back on the right path with Frances Minerva Williams Heath’s death notice in one of Ithaca’s newspapers. I was off to the beautiful lakeside village of Pewaukee and the intense environment of Washington, DC and the beautiful environs of Japan. It wasn’t long before the county of Waukesha, Wisconsin brought me to the sisters named Frances and the subsequent discovery of my “cousins”. There is Dwight Bradley in Alaska, a descendant of Frances Amelia. He owns apple orchards like his ancestral grandfather in Enfield, New York. And then there are the grandsons of Trixie Eldridge. The Tegners. Trixie married Danish merchant Frederick May Tegner in May of 1895 in Yokohama, Japan. When Frederick died in 1919, evidently from a ship sinking in the Indian Ocean, Trixie made her way to England with her four sons, William, Henry, Sven and Stuart. And so I found my connection to the Williams-Tegner family members. Once again…I GOOGLED® and found myself reading Henry Tegner’s accounting of the life of Stuart Eldridge and the charming story of Henry’s son’s wedding in Japan. I took a deep breath and reread his blog realizing that my history and the Tegners had found ourselves coalescing in Japan. My son, Michael, like Henry’s son, was married in Japan. We were descendants of Dr. Parvis Austin Williams and I knew it. We began our family journery in Enfield…found our history in Japan and eventually full circle to Philadelphia. Did the Tegners know of Frank’s family history? Maybe not. It was time to find them and make the connection. The rewards of connecting our lineage have been rich and exhilirating beyond my wildest imagination. I now have the pleasure of working with Stuart-Eldridge family members, Sue Campbell and Dan Stites of California and Jeff Keith of Philadelphia and my fellow descendants of Dr. Parvis Austin Williams – Bill, Ian and Henry Tegner. I will have the pleasure of meeting my fifth cousins, Bill Tegner and his wife, Pam this June in Philadelphia, New York. Recently I discovered a reference in an old book in the Harvard Library listing his great grandfather’s donation to the University of Pennsylvania Museum of Archaeology and Anthropology which were donated by Stuart Eldridge in 1897. A couple of emails and phone calls and the curators were in touch inviting us to view the artifacts and to share the Eldridge history. I was on a roll and based on historical and family data knew that Stuart’s family were prominent members of the Old Pine Street Episcopalian Church. Indeed they are buried there. Another phone call and I had arranged a tour of the old Church and its historic graveyard by historian Ronald Shaffer and a celebration of the Eldridge Stuart history with the historic church. As of this posting, I received an email from museum official, Kaye Spilker, stating that they indeed were in possession of the “remarkable” Boardman quilt and I await the details of the ladies’ names stitched into the quilt and for permission for “cousin” Sue Campbell to have a special viewing of the quilt, take archival photos and hopefully, gaze upon her ancestral grandmother’s name. After more thoroughly reading the extracts from Stuart’s journal from 1871, I discovered that he sent a box of items to the Smithsonian and have been in contact with officials there to determine whether his contribution still resides as archival inventory. Author’s Notes: I realize that once again I have written a lengthy post, but editing this post was so tortuous that I decided to just let it all stand and beg your forgiveness. The fact is, there is so much more rich history to these ancestors that I was almost lost among the research for weeks and there is so much more to be told. For the moment, I am enjoying my new found cousins and our common passion for our grandparents’ history and look forward to gathering in Philadelphia to celebrate our past and to toast our family’s future. This entry was posted in Uncategorized and tagged Boardman Quilt, Eldridge, Enfield New York, Fisk Holbrook Day, Gaspar, Genealogy, General Horace Capron Expedition, Heath, history, Philadelphia, Stuart, Third Presbyterian Church of Philadelphia, Tompkins County, Union Steamship Company, Waukesha Wisconsin, Yokohama Foreigners Cemetery, Yokohama Japan. Bookmark the permalink. This is an amazing story. You are a talented writer. Deb – I agree with Carol that you are a talented writer. Thanks so much for organizing all the family history into such an interesting story to read. You have a way with words! Charlotte Louise Ely – Alfred B. Britton Jr.
Greetings Deborah from another of your fifth cousins. I have so enjoyed reading this detailed account of the life of my great-grandfather Stuart Eldridge. Thank you for all your hard work and application. One day I hope that I shall have the pleasure of showing you his journals recounting his early days in Japan which remain in my safe keeping. As you probably know we visited Tokyo and Yokohama in 2001 on the centenary of Eldridge’s death, for the occasion of my son’s wedding to Kyoko. We visited the Eldridge grave then. I hope to get some details of the wedding on to my web pages in due course. I think you will agree, when you see the photos, that John, my son, has some of the Eldridge features.